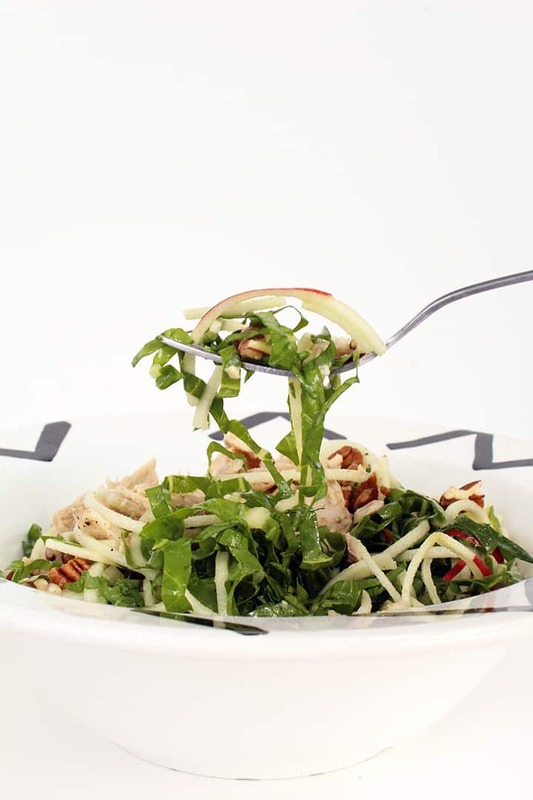 Shredded chard should be on every single menu at every single restaurant… in the world! Now if that doesn’t express my enthusiasm for shredded chard, I don’t know what will. Originally, I was going to recreate one of my older recipes with better pictures and post it up today – I had been craving it for dinner, so I figured why not kill two birds with one stone and make a blog post out of it and save the rest for leftovers. That recipe was this one – the Escarole and Lentil Tower with Zucchini Pasta. As I was taking my Tupperware container full of lentils, the top slid off and – BAM! – lentils all over my kitchen floor. Lentils for days. Lentils under my carpets, lentils in my sneakers, lentils under my sink, lentils in every single crevice of my kitchen you could imagine. I even found lentils under the couch! Ugh. Obviously, I scrapped the lentil tower, because, well, the lentils were “dirty” and I was frustrated. Sometimes, a girl’s gotta take a hint from the powers that be, ya know? The lentil tower was not in the cards for me that day. I had swiss chard that I bought for dinner, but I realized that I forgot I wasn’t going to be home Thursday or Friday of this week, so it was most likely going to go bad. I opened up my fridge, grabbed the chard and looking for inspiration, I Googled “chard salad” and came up with a Food52 recipe, featuring shredded chard. GENIUS! I’d make a salad with shredded chard. I’d been meaning to make a tuna salad for lunch, so using that mindset, I landed on today’s recipe. Honestly, the apple noodles seal the deal here. Without the apple noodles, you wouldn’t get that crunchy, light, moist consistency or the sweetness that negates any bitterness that comes with uncooked chard. The pecans are for the crunch and because who doesn’t love pecans with apples? Or pecans alone. Or in a house, with a mouse.. or in a box, with a fox. Okay, if you didn’t get that Dr. Seuss reference, I’m disappointed. 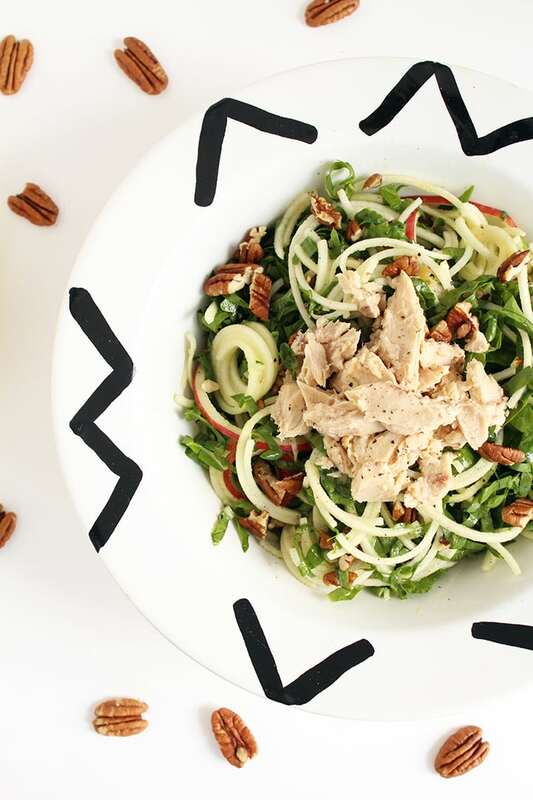 Make this shredded chard and apple noodle salad for lunch or for a light dinner – it’s perfect for the summertime, as nothing’s cooked or warmed. It literally took me 10 minutes to make and leftovers for dinner were even better, as the vinaigrette sat with the chard and apples for a few hours and softened them. I’m totally putting shredded chard somewhere in the cookbook. How do you prefer your chard? Place all of the ingredients for the dressing into a bowl and whisk until combined. Set aside. Lay out the chard leaves. Cut out the thick stem and stack the leaves. Roll the stack up into a cigar and cut into thin ribbons to “shred” the chard. Combine the chard, apple and pecans in a large mixing bowl. Add in the dressing, saving about two teaspoons. Toss to combine fully and then divide into two plates. Top the plates equally with tuna and drizzle the remaining vinaigrette onto the tuna. Season with cracked pepper. Sounds yummy! Does it matter what variety of apple you use? Nope, total preference to you! I used Gala! It really is amazing - total game changer, you must try it!! I've never eaten swiss chard raw - always sauteed. I will try this recipe, sounds delicious and perfect for a hot day. If you don't have tuna, cooked chicken would also work as a sub. Sounds great. I bet shredded, rotisserie chicken breast would also be good! How do you spiralize an apple? Do the seeds create a problem? This sounds delicious! I have rows of baby chard in my garden that need thinning, so this recipe came at the perfect time! You can see a video on spiralizing an apple, here: https://vimeo.com/82381954 - hope that helps!! So you eat the harder core part? I see how the seeds would just fall out but don't you taste the core? Will the apple brown if you make it the night before for lunch? It may, but the lemon juice will help! It will still taste delicious, even though it might brown! Hey there! If you spiralize your apples directly into a lemon juice/water mixture, and slosh them around a bit until they all get covered, that usually does the trick to keep them from browning too much. Dr Seuss rules! Totally got the reference :) I can't wait to make this for dinner or lunch ASAP! 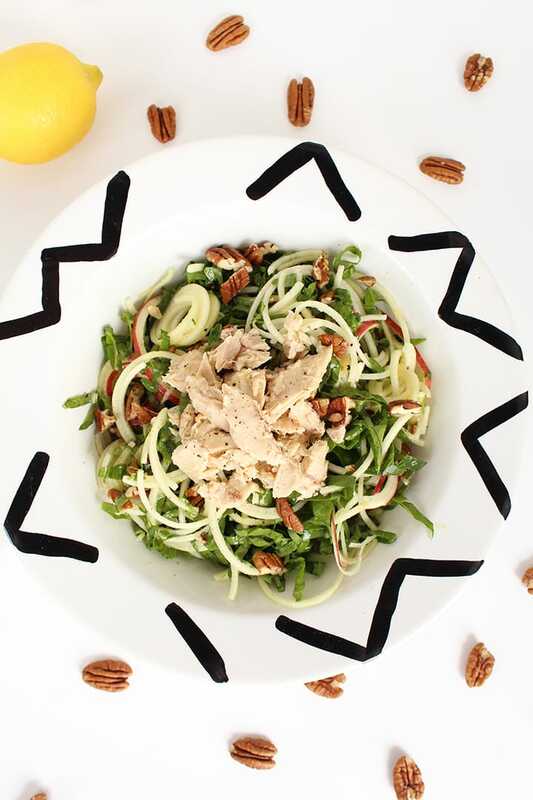 I can't wait for my Spiralizer to arrive so I can start making these delicious, healthy recipes! I love that there are bites of sweetness from the apples along with the chard (my favorite green) with every bite of this salad! And BOO to the lentils. I have totally done that before. And of course, it always seems to happen when you're hungry enough to bite your hand off. Just made this for dinner, it was perfect on a hot summer night. I followed the recipe to a tee and added Strawberries since I had them on hand. My husband loved this and wants me to make it again already. Mmm, I'm thinking cranberries (craisins) or raspberries would be good in this also! Made this for dinner last night - even my skeptical boyfriend loved it! First recipe tried since getting my Spiralizer earlier this week and it was a huge hit. Making Bolognese with spiralized zucchini for dinner tonight - fingers crossed that it goes over as well as the salad did! Thanks for the great recipes, and I love reading your blog. We had this for supper tonight. It was very good. 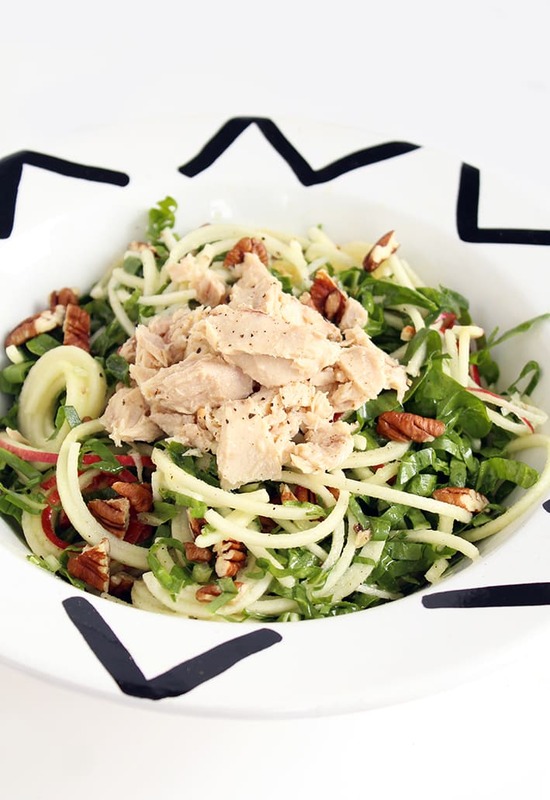 The tuna, pecans, chard and apple came together into to a great mouthful of flavors. This is a keeper. Thank you. We missed lunch, so I just tossed this together. No chard, so I used kale, and no pecans so I used hazelnuts. Absolutely delicious! Great salad. I think I had the ratio if chard to apples a bit skewed to the chard side bc it was a little too bitter to me. The hubs lived it and wants it again. This is probably a silly question, but what happens to the core and seeds when you spiralize an apple (or a pear for that matter)?! I came across this recipe and decided to make it right away knowing I had a can of tuna in the pantry! Sadly, I'm not a big tuna eater, and the can had expired a year ago, but I threw together what I had and used a hard-boiled egg as protein source instead. My spiral cutter couldn't handle the apple but at least that's an easy fruit to cut in thin pieces. I just wanted to say the vinaigrette is AMAZING! Will definitely be throwing it together for more salads in the future! well, I learned that I don't like chard. Aside from that, I'll try this recipe again with Kale, spinach or romaine. This looks so good, and I can't wait to try it! I made this the night before and brought to work for lunch. FABULOUS. I was concerned it would get soggy or the apples would brown, but they didn't. I added a hardboiled egg for a little more protein. Seriously, everything I make from this blog is excellent. Thanks, Alli! This looks amazing! I hope you don’t mind but I reposted this on my blog (with a link here of course!). I’ll be trying this tomorrow!